Your HostGator cPanel now includes our WordPress Self Help Tools. These tools make it easy to perform checks on any WordPress database, and to easily modify the database to change the target domain. HostGator recommends making a full cPanel backup before making any major changes to your account. 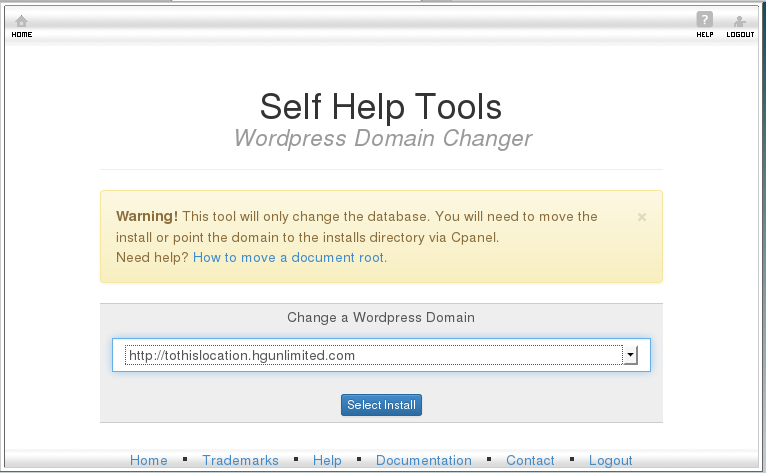 Click the WordPress Self Help Tools icon. Two tools are displayed - Database Tools and the Domain Changer. This contains a tool to check connectivity for all WordPress databases under this cPanel. Click the Database Tools icon. Check the box next to Connectivity Check and click Run Checks. The results returned will show the status of each WordPress database. This tool will change the domain information for a selected WordPress installation. HostGator does not recommend completing this without having a backup as running this tool could potentially break your site. Click the Domain Changer icon. Under Change a WordPress Domain, select the WordPress installation you wish to change and click Select Install. Choose the new domain from the dropdown list and click Change to this domain. A confirmation message indicates a successful domain change. To perform another domain change, click Clear and Start Over. Please feel free to contact us via phone or Live Chat for assistance with your account.